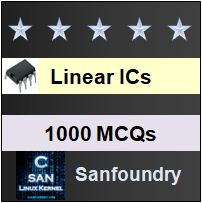 This set of Linear Integrated Circuit Multiple Choice Questions & Answers (MCQs) focuses on “Voltage Shunt Feedback Amplifier”. Explanation: A voltage shunt feedback amplifier forms a negative feedback because, any increase in the output signal results in a feedback signal into the inverting input causing a decrease in the output signal. 2. The value of feedback resistor and resistor connected in series with the input signal source are equal to 10kΩ and 3.3kΩ. Calculate the closed loop voltage gain? Explanation: Closed loop voltage gain, AF = -RF/R1 = -10kΩ/3.3kΩ = -3.33. 3. Write the formula for closed loop voltage gain of inverting amplifier with feedback using open loop voltage gain and gain of feedback circuit. Explanation: The closed loop voltage gain of the amplifier is AF= -Ak/(1+AB), where k is a voltage attenuation factor. In addition to phase inversion, AF is k times the closed loop gain of the non-inverting amplifier where k<1. Explanation: The input and output signal in voltage series feedback amplifier are 180o out of phase (or of opposite polarities). Due to this phase inversion, the configuration is also called as inverting amplifier with feedback. Explanation: The block diagram of non-inverting amplifier is identical to that of inverting amplifier except for the voltage attenuation factor or block. However, the major difference is that a voltage summing junction is being used as a model for what is actually a current summing. Explanation: Ideally, the difference between input voltages is zero. Therefore, the voltage at the inverting terminal is approximately equal to that of non-inverting terminal. In other words, the inverting terminal voltage is approximately at ground potential and it is said to be virtual ground. 7. Compute RIF for an inverting amplifier with feedback, where the value of input resistance of op-amp is 4.7kΩ. 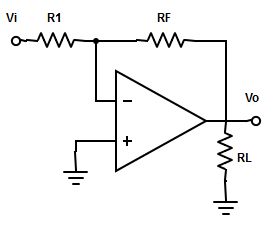 Explanation: In voltage shunt feedback amplifier, the input resistance with feedback is given as RIF = R1 (ideally). A=200000; Ri=2MΩ; Ro=75Ω; Supply voltages= ±15v; output voltage swing =±13v; fo=5hz. Compute the value of output resistance, bandwidth and closed loop voltage gain for the circuit shown. Explanation: Output resistance of the amplifier, ROF= Ro/(1+AB) =, where B= R1+RF = 330Ω/330Ω+6.2kΩ = 0.053. => ROF= ±75/(1+200000*0.053) = 53005hz. => AF = -(200000*0.949)/[1+(200000*0.0535)] = -16.95. 9. What is the break frequency of the op-amp? Explanation: The mentioned formula is the general break frequency of any operational amplifier. Explanation: Voot equation for inverting amplifier is the same as that of the non-inverting amplifier because, when the input signal is reduced to zero, both inverting and non-inverting amplifier results in the same circuit. 11. 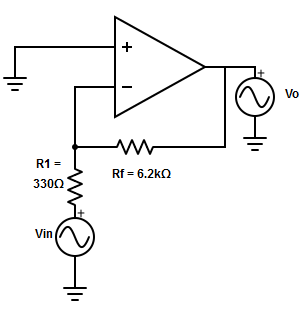 Which among the following is not a special case of voltage shut feedback amplifier? Explanation: A voltage follower is a special case of non-inverting amplifier ( or voltage series feedback amplifier) and it has a gain of unity. 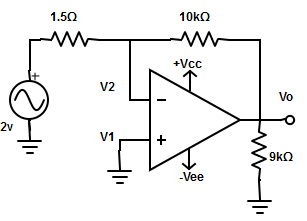 Explanation: The given circuit is a current to voltage converter. Since V1 =0v and V1= V2. => iin = Vin/R1 = 4/ 1.5kΩ =2.67mA. The output voltage Vo = -iin*RF = -2.67mA*10kΩ = -26.7v. Explanation: If R1 = RF, the inverting amplifier will work as an inverter. => Vo=- iin*RF=6.4mA*4.7kΩ = 30 Vpp sinewave at 1khz.